Rajendra Chola II is very well remembered for his role in "The Battle Of Koppam". He was born in a great dynasty which saw great emperors like Karikala Chola, Vijayalaya Chola, Aditya Chola I, Parantaka I, Rajaraja Chola I, Rajendra Chola I, Rajadhiraja Chola I etc. Rajendra Chola II is the younger brother of Rajadhiraja Chola. He ruled between 1054-1063 A.D. He succeeded his brother Rajadhiraja Chola in 1054 A.D. He was successful in maintaining a vast empire which was given to him by his elder brother. No loss of territory was recorded during his reign. Rajendra Chola II was declared earlier in his life as co-regent by his brother Rajadhiraja Chola. He shared the administration of empire with his brother. He handled the internal affairs of the state as a co-regent. During the reign of Rajadhiraja Chola and when Rajendra Chola was a co-regent, Rajadhiraja wanted to suppress the rising power of Chalukyas in Northern Karnataka and Southern part of Maharashtra and annex them to Chola empire. The king of Chalukyas was Somesvara I. In 1053 A.D., Rajadhiraja Chola along with his brother Rajendra Chola II led a campaign against Chalukyas. Somesvara I knew very well that he would be very easily defeated by Cholas but there was no option for him other than facing the mighty Chola forces. The two army forces met at a place called Koppam. This battle is referred as "Battle Of Koppam". The battle started, Chola troops were holding the upper hand. Suddenly Chalukyan archers shot Rajadhiraja Chola who was riding a war elephant leading Chola forces from the front. He was wounded mortally. He died fighting on the elephant in the battle. On seeing this, the Chola troops panicked and began to retreat. Somesvara I for a moment thought that he won the battle but he was wrong. Rajendra Chola II immediately took command of the reserved forces and boosted the energy in the Chola army. An ordinary king would surrender in such situation or run away but Rajendra Chola II who had mighty Chola blood in his body was not ordinary. He was successful in boosting the confidence of Chola troops and rallying them together. The battle continued and this inflicted heavy losses on Chalukyan forces. The mighty Cholas won the battle and Rajendra Chola II crowned himself as the king of Chola empire and erected a victory pillar at Kolhapur. 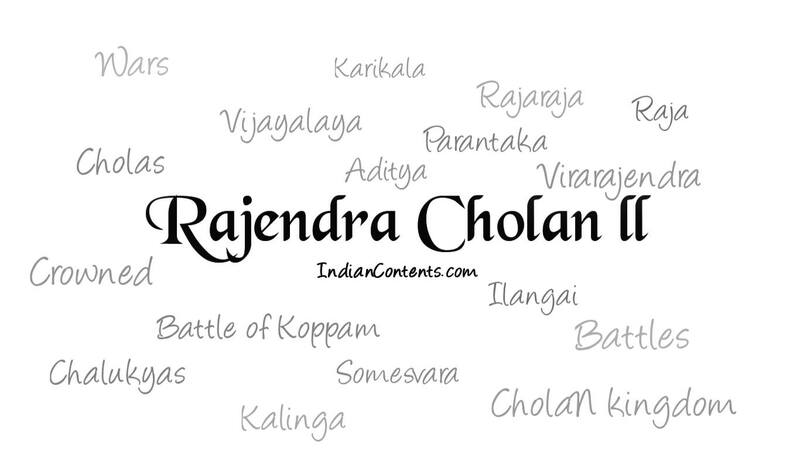 Thus Rajendra Chola II was the man behind the victory of Cholas in "Battle Of Koppam". 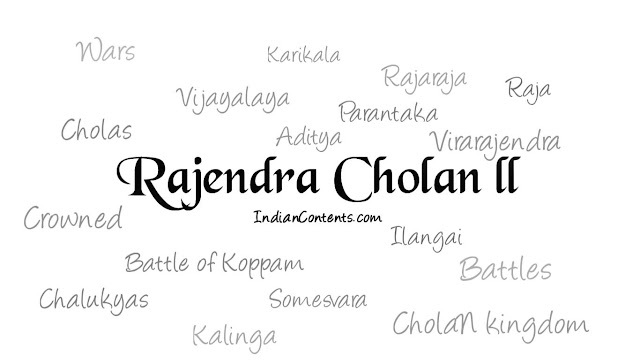 After winning "Battlle Of Koppam", Rajendra Chola II invaded Kalinga kingdom and Ilangai (Srilanka). The king of Kalinga Vira Salamegha aided the king of Ilangai Manabharanan when Ilangai was attacked by Rajendra Chola II. The king of Kalinga was killed and two sons of Manabharanan were captured by Rajendra Chola II in Kalinga war. He was succeeded by his younger brother Virarajendra Chola in 1063 A.D.